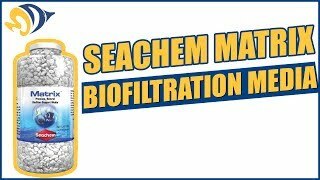 SeaChem Matrix is a high porosity biomedia that provides efficient biofiltration for the removal of nitrogenous waste. Matrix is a porous inorganic solid about 10 mm in diameter. Each liter of Matrix provides as much surface (<162 m) as 40 liters of plastic balls! Plastic bio-materials provide only external surface area, whereas Matrix provides internal macroporous surface area. These macropores are ideally sized for the support of nitrifying and denitrifying bacteria. This allows Matrix, unlike other forms of biomedia, to remove nitrate along with ammonia and nitrite, simultaneously and in the same filter. Matrix is completely inert and will not breakdown. It need not be replaced. Use 1-2 Liters of Matrix for each 100 gallons. Since the majority of the bacteria are internal, Matrix may be rinsed when needed without damaging the filter. Matrix is compatible with all types of wet or wet-dry filters. Marine or freshwater use. Good media if you want a minimal aquascape. Cheap compared to others and doesn't leach anything like some other media does. Seems to work but haven't seen any denitrification happen. Matrix works. Great replacement for tanks with little to no live rock.or if you just want add some additional surface area for bacteria to grow Takes time to work, so don't expect results overnight. If you don't like the look of tons of live rock in the display and don't have alot of room in your sump, use this. It works great!